Each image in the SepiaTown collection is represented on the map by a small thumbnail image. These image markers are located at the vanage point of the image they represent. To select an image, simply click on its image marker on the map. Clicking on these image markers is how you browse the images on SepiaTown. If no images appear on the map at a given location, then no images of that location have yet been uploaded to the SepiaTown collection. After an image has been selected, its map marker is replaced on the map by a small, orange, human figure. This figure stands on the selected image's vantage point and faces the direction the photographer or artist stood at the time the image was created. Use the zoom slider on the left side of map. 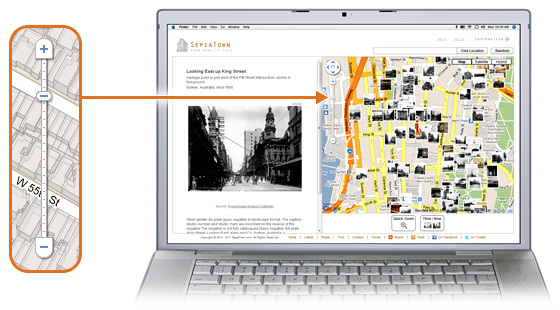 Double-LEFT-click or double-RIGHT-click an area of the map unoccupied by an image marker to zoom the map in or out. Use the hotkeys "+" and "-" on your keyboard. Zooming in the map will cause more and more image markers to appear and allow you to see all the available images within the visible section of map. At zoom setting 5 and closer, all available images will be represented by visible image markers. Zooming the map in will also cause the image markers to spread out and make browsing images easier in densely 'SepiaTowned' areas. The 'Quick Zoom' button allows you to instantly zoom the map to a close, centered view of the selected location. Once initiated, the button turns into a 'Back Out' button that allows you to quickly reverse the process with another click of the mouse. Move cursor-hand to an area of the map unoccupied by image markers then hold down the left mouse button and drag the hand in the opposite direction you want the map to pan. Click on the arrows in the pan control circle located at the upper left corner of map. Use the direction arrows on your keyboard. Use the map mode buttons in the upper right hand corner of map to select between 'Map', 'Satellite', or 'Hybrid' mode. 'Map' mode is the default setting that the SepiaTown opens up in. Any mode you select will stay in effect until you change the setting or end your session on SepiaTown. Each map mode has its own benefits and lends itself best to browsing different kinds of enviroments. The 'Find Location' text-entry box appears above the map at all times. To use it, simply enter the name of your desired location into the box and click the 'Find Location" button. Name of a Landmark, Square, Park, etc. You can also search for a location by zooming and panning the map to arrive at your destination. Often it is useful to use the "Find a Location" box to get to a general view of a location then use the map controls to fine-tune your search. Clicking the 'Random' button atop the upper right corner of map will instantly send you to a different, randomly selected image in the SepiaTown collection. If you continue to click on button you can take a fun historical tour around the globe. You can instantly compare the historical images in the SepiaTown collection to a contemporary view on the same scene by clicking on the 'Then/Now' button. Once intiated the map will be temporarily replaced by the Google Street View perspective that is closest to the vantage point of the historical image. Sometimes the contemporary 'Then/Now' perspective lines up perfectly with that of the historical image, sometimes this perspective and location need to be tweaked for proper matching, and sometimes the perfect vantage point has not yet been street viewed by Google and is thus not available. This window is live. You can use it to try out the navigation techniques described below. You can move to a new perspective point by clicking on the directional arrows superimposed over the street scene. You can also skip ahead by double-clicking on any spot further up the street and you will be taken to the perspective point closest to that point. You can also initiate perspective point changes using the directional arrows on your keyboard. At each perspective point the Google street view camera makes a semi-global 360 degree view of the scene. Thus, you can pan around these perspective points horizontally and vertically in all directions. To do this click-hold the cursor on the scene and move cursor in the opposite direction you want to pan. You can also pan around the scene using the directional arrows on your keyboard. You can zoom in and out of the 'Then/Now' view using the "+" and "-" controls on the left side of street view interface. Zooming will allow you to get a closer look at details in the scene or to re-frame the view to best line up with historical image. You can also zoom in an out using the "+" and "-" key on your keyboard. If you'd like to bookmark, email, or link to a SepiaTown image page use the permanent URL provided in the permalink box located in the left colum of image page, not the URL in the address bar of your browser.